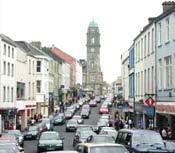 Enniskillen is the County Town of Fermanagh and is located at the junction of Upper and Lower Lough Erne. The town centre is in fact located on an island in the Erne waterway with a number of bridges connecting it to the main thoroughfares. The main historic attractions within the town include the Fermanagh History and Heritage Centre and the Regimental Museum of the Iniskilling Fusiliers. The Heritage Centre contains artifacts on local farming and manufacturing, whilst the museum is packed with medals, guns and uniforms of the fusiliers and the dragoon guards. 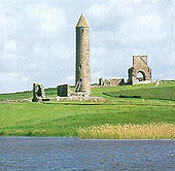 Fermanagh has a long history of Christian settlements yet the religion was slow to penetrate the local pagan culture. Viking and Norman invaders couldn't subdue the region and even the Tudors were unable to do so until after 1600 - this was when Enniskillen fell to the English. Planters quickly moved in and a series of castles were established. Enniskillen was soon transformed into a centre of colonial power. Strategically its importance to the British led to the town possessing two royal regiments. St. Ronan, one of the county's important early Christian missionaries, is said to have founded a church in the 7th century at this spot a mile and a half south of Lisnaskea, where many Maguire chieftains were buried. Of greater interest than the ruined church with battered walls are the 18th century gravestones, some kept locked in a stone vault. A 12th century carving of a figure bearing book and cross, which may once have adorned a now-vanished tomb-shrine of St. Ronan, is now exhibited in the Fermanagh County Museum in the Castle at Enniskillen. This site contains the substantial remains of Lough Erne's most important island monastery. St Molaise founded it in the 6th century on an historic pilgrim route to Croagh Patrick. It later became an Augustine Priory of St Mary. The remains include a Romanesque church and a 12th century round tower, crosses and the Priory Church. Visitors can climb the islands most striking feature, the perfect round tower, which is 30 metres tall. This island contains the remains of a twelfth century church. Attached to the North wall of the church are a set of curious stone figures believed to date to around the 9th or 10th century, there are six carved figures and a roughly cut stone ready to be carved which suggests the figures may have been carved on site. To the right of these is a carving of a head (mask) which may be of a later date. The figures are numbered from left to right, It was recently suggested that the figures may represent pilgrims, but whatever the reason for these stone figures they are certainly very impressive. Situated amongst the mountains and forests of West Fermanagh, Florence Court is a fascinating example of mid-18th century Irish Palladian architecture. The present house, the former home of the Earls of Enniskillen, was started by John Cole and completed around 1775. It was named after Florence, his wife. One of the chief glories of Florence Court is the exceptional embellished rococo plasterwork, seen at its best at the top of the stairs and in the dining room. This probably dates from 1755 and is in the style of Robert West, Dublin's leading 18th century stuccodore. The house contains fine Irish furniture including an 18th century rococo armchair in the library, an Irish writing cabinet which dates from 1730 and an unusual 18th century bed. On the outskirts of Enniskillen, Co. Fermanagh stands Castle Coole, the family home of the Earls of Belmore and one of the treasures of the National Trust. Designed by James Wyatt, this magnificent neoclassical house took ten years to build. It was completed in 1798. The interior of the house was created by some of the leading craftsmen of the late 18th century with chimney pieces carved by Westmacott, plasterwork created by Rose, scagliola columns and pilasters created by Bartoli. Highlights of a tour of Castle Coole are the magnificent state rooms with their sumptuous Regency furnishings. These include the State Bedroom, said to have been prepared for a visit by George IV in 1821. The surrounding 700 acre estate is a fitting setting for the house, with parkland, Lough Coole and extensive woods. 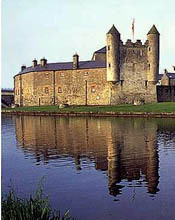 Nestled amid Fermanagh's lakeland on the banks of the picturesque River Erne you will find Enniskillen Castle. This fine castle, once the home of the Gaelic Maguire chieftains, represents an important part of Fermanagh's rich history and heritage. Enniskillen Castle presents an array of 19th century barracks buildings surrounding the Medieval Castle Keep; to the south with its distinctive turrets is the 17th century Watergate and to the east is the Heritage Centre built in 1992. Throughout the 16th century the junior branch of the Maguires ruled Fermanagh from Enniskillen Castle, their stronghold being captured and retaken many times by the O'Donnells, O'Neills and the English. The Heritage Centre exhibits the collections of the County Museum in award winning displays enhanced by audio visual programmes about Fermanagh's history, wildlife and landscapes. There are also special exhibitions throughout the year. Housed in the Castle Keep of Enniskillen Castle the museum has displays which span the history of the Regiment from its formation in 1689 up to modern times. The Collections trace the history of the regiment from its formation in 1689 to amalgamation in 1968. It is illustrated by a large and well laid out collection of uniforms, weapons, medals, photographs, silver, standards, badges and other regimental memorabilia. A library containing war diaries and archival material is available for research purposes by appointment. Each important part of the Regiment's history is well covered by the collections.